Spot a tree? Chop it down! It’s official now: if you find a tree still standing, chop it down. 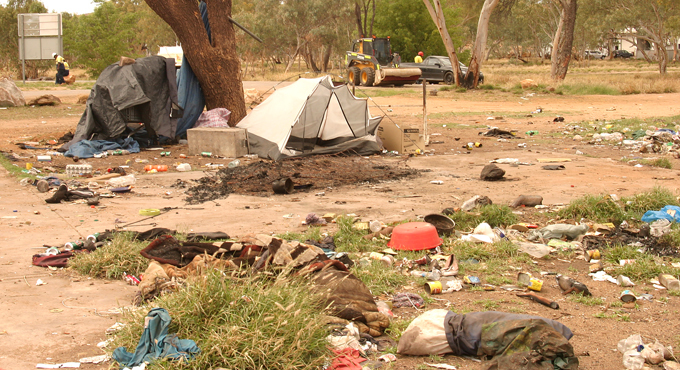 The latest victims are 25 well-established gums in the poetically named Road 4 in the Larapinta town camp. The camp is not blessed with an abundance of flora: new houses, built under the $150m Federal initiative to upgrade the camps, now near its end, has produced neat new buildings on barren and dusty blocks. The 25 trees along Road 4 were a welcome relief. Now all that’s left are stumps. 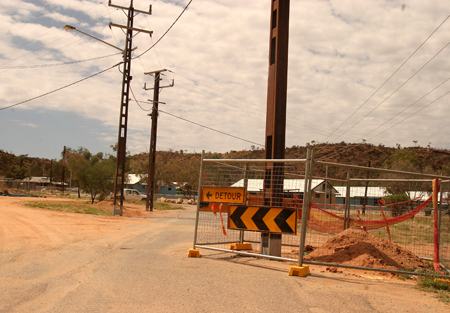 Territory Alliance Manager Allan McGill said today (Nov 8) the trees were cut down “to allow for the installation of new electrical power lines and water services. “In keeping with standard design practices, the installation of power and water must follow the new alignment of the road. Mr McGill did not explain why the services could not be installed on the opposite side of the street where there are no trees. He says the Territory Alliance “has all necessary Aboriginal Areas Protection Authority certificates and no sacred trees were disturbed. It was a case that attracted widespread reporting and commentary back in June: a young mother was arrested and charged for an alleged assault on her 16-month-old son. 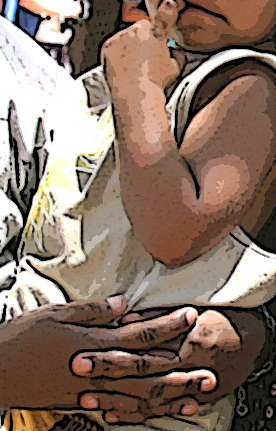 The details of the allegation, made by the child’s father and revealed by a police media release at the time, were shocking: the father said his wife had hit the child over the head a number of times with a can of soft drink, picked him up by one leg and slammed him into the ground three times and then into a fence, before holding his head under her arm and punching him to the head. In court last week there was no-one in the public gallery to hear the evidence about what happened – apart from the Alice Springs News. In the witness box the father stuck broadly to his original story while the young woman firmly denied most of it, admitting only to shaking the pram in which she was pushing the child and slapping him on the cheek three times. She also admitted to threatening to kill the child, with the words “I’ll kill your son”, but she said, “I didn’t do action”. Town council self censorship: ‘In confidential’ lame excuse for hiding facts from the public. Above: This is what the center of Charles Creek camp looks like. Below: This traffic way is hardly ready for handover, unless having power poles planted in the middle of a road is the latest fad in town planning. The Town Council has a nifty way to hide behind closed doors matters that should be in the public domain. The latest such issue is the handover to the council of the town camps which have recently undergone a Federally funded $150m facelift. The question is, is all the infrastructure up to scratch before it becomes the responsibility of, and a financial liability for, the rate payers? It’s a question Mayor Damien Ryan, the aldermen and council staff are not allowed to discuss in public – under threat of penalties including a gaol term. But the other half of the story is this: these elected members can at any time take matters out of confidential, which makes their assertion that their lips must remain sealed just so much hypocrisy. Meanwhile, local identity Russell Bray is engaging in some stinging citizen journalism about power poles with this video. 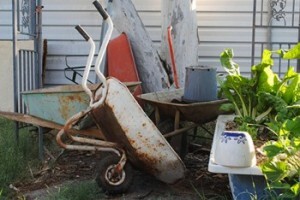 So says Linda Collis, from Redlynch, QLD, who with this snap won the competition “There’s nothing like Australia” run by the Federal Government’s Tourism Australia. Parks NT, which manages the reserve, says fighting buffel grass is one of the reasons for the drastic access limitations. The only way Ms Collins could get “totally exhausted” on that short path is carrying a very heavy weight and running backwards and forwards. Tourism Australia Managing Director Andrew McEvoy does have a point when he describes the campaign’s objective as Australians “promoting what is special and unique about their country last year to the rest of the world”. Not many countries would restrict access to some 90% of a national park to a minority of Indigenous people. ERWIN CHLANDA reports. It was a “beautiful, gentle voice – always”. It belonged to Sister Eileen Heath, who has passed away just short of her 106th birthday at the end of November. 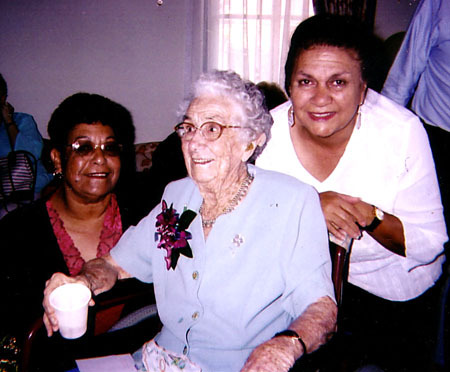 Ronda last saw her in Perth when she was celebrating her 104th. 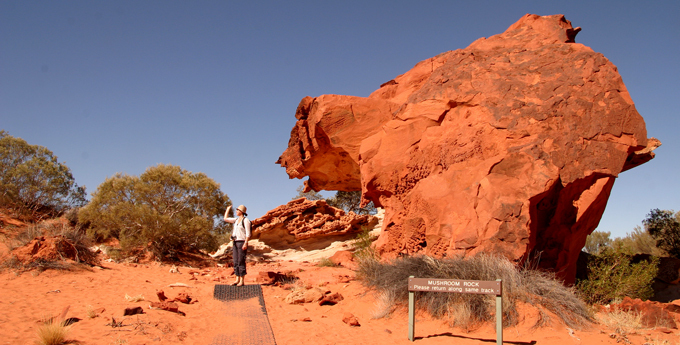 Mrs Ross tells KIERAN FINNANE how she remembers a great Central Australian. Pictured: ‘Belles’ of St Mary’s (married names in brackets, if known) from left, Sister Eileen Heath, Ronda’s sister Fay Andrew (Hampton), Shirley Dixon (Stuart), Ruth Forrester (Swan), Rosalie Kunoth (Kunoth-Monks). 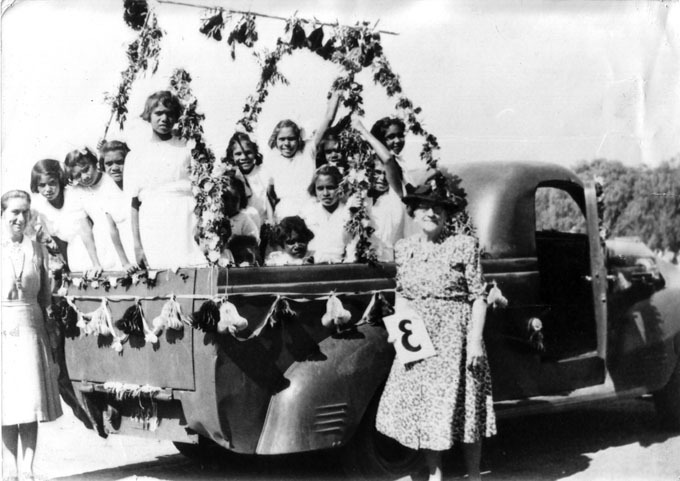 Next to Rosalie in the back row are Wendy Bourke (Espie), Doris Branson (Campbell), Eileen, or possibly Ivy Foster peeping from behind the garland, and Mona Bathern. There are three little girls in shadow next to Rosalie and then in front, Marie Liddle (Palmer), Peggy Foster and Patsy Clements (McDonald). Standing in Front of the Dodge is Mrs Lillian Schroder, who travelled with Sister Eileen and helped her in her work. Photograph courtesy St Mary’s Children Home. Jobs galore and not many takers: The town’s biggest construction project right now is Lasseters’ $35 million development. The new resort style pool is part of it, due to open at the end of this month. Claire Ryan Photography. “A lot of people have two jobs to keep this town going. “Many businesses have scaled down, passed up bidding for big jobs, closed their premises and are working from home. They can’t get staff,” says Kay Eade, Executive Officer of the Chamber of Commerce. Yet there are 543 “job seekers receiving Newstart Allowance and Youth Allowance” in The Alice, according to the Department of Education, Employment and Workplace Relations. 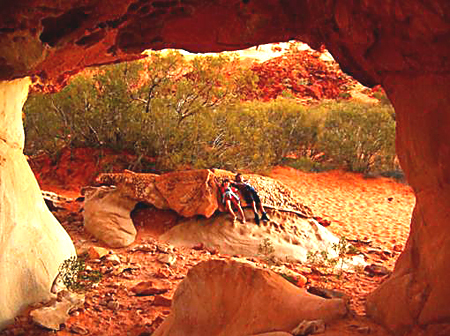 The department’s “Central Australian Remote Servicing Team” lists 1649 job seekers and Yuendumu, 85. Tall Tales but True: Brought to you by the National Transport Hall of Fame in Alice Springs. Christopher (Chris) Kuhn started work for the Commonwealth Railways in 1928 and went on to work for them on the Marree to Alice Springs section until 1953. His job was to use a horse and scoop to clear the ever-shifting sand drift and debris from flash floods and windstorms off the track so the Ghan train could get through. The Old Ghan train was notorious for literally being stopped in its tracks and it was Kuhn’s job to ensure the train could get through gaps in the sand dunes. Sometimes the track collapsed because termites had gnawed through wooden sleepers. If the train got stuck a goat, or other game, would be shot so the passengers could be fed. Those were the days too when all litter from the train (ablutions, kitchen waste and tins) were dropped through chutes to the track. It was a harsh and thankless environment: working in freezing cold or searing heat and open to the elements. 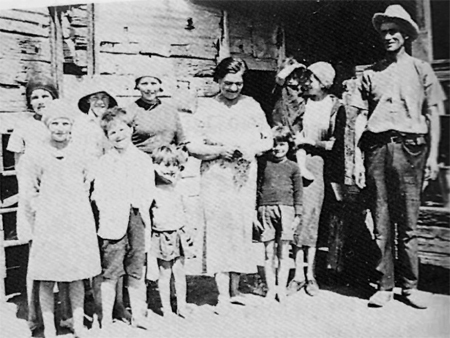 Chris Kuhn and his wife Mary lived at Irripitana just south of William Creek for many years. Following the line as it progressed towards Stuart (now Alice Springs) it was a harsh and nomadic life and yet they managed to raise 12 children. The family were known by all Commonwealth Railway staff and regulars who used the line to be friendly and welcoming and willing to lend a hand to anyone in need. 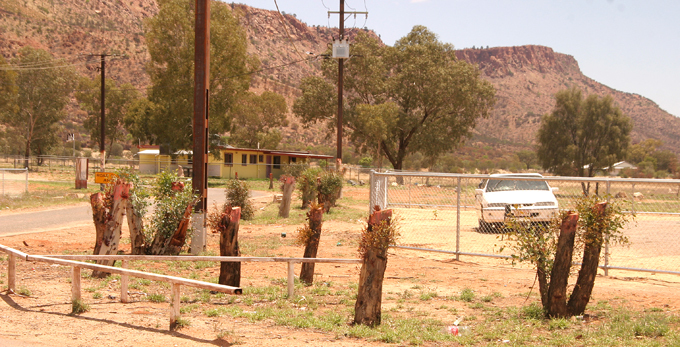 Following the tragic loss of a daughter the family moved into Alice Springs.